Res Ipsa Knit With Her: Doesn't Everything Revolve around Knitting??? This weekend was the Art in the Park Festival. Art in the Park is one of my favorite events. It happens every May and is a juried art festival so the artists tend to be really great. Usually I go both days but this year I was in New York on Saturday so I only got to go on Sunday. (BTW - I did sneak out to a yarn store in SoHo so more on that when the box arrives . . . .) I did my best to cover it all and had a great time. It's funny how knitting can take over your life. I find myself looking at the art and thinking of how it can translate in to knitting! There were lots of cool fabric purses and I found myself looking at them thinking "How could I knit something like that!" Also the color schemes in purses and paintings of course MUST be translated over to knitting. 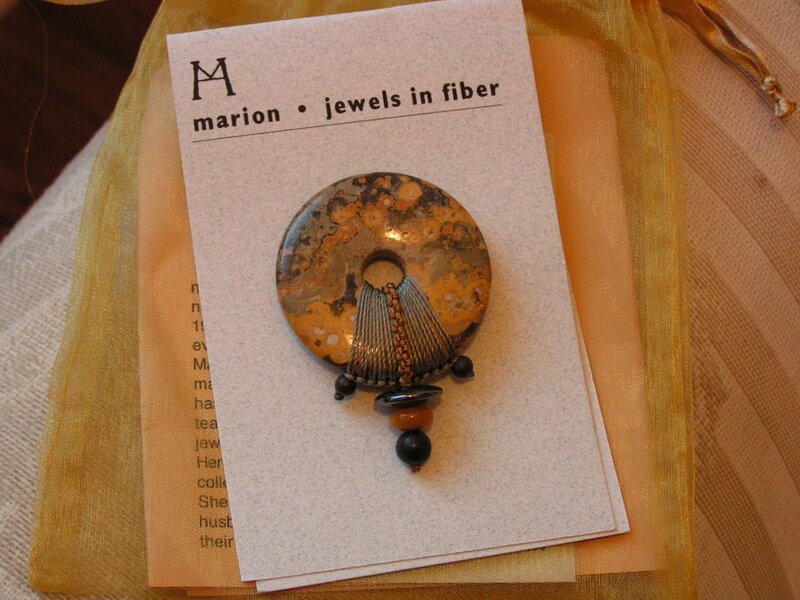 Finally, there was an artist named Marion who made these "Jewels in Fiber". Basically they were beautiful rounds stones with string and beads attached to them as pins, necklaces and earrings. She had a lot of gorgeous stuff but I picked out the beauty above with the plan to - you guessed it - knit something! 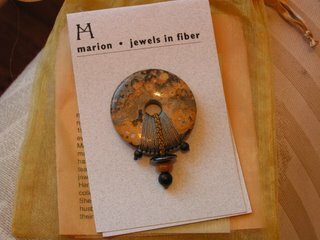 This jewel is a pin and I'm thinking of making a felted purse and putting this on as the main ornament. I just loved it but don't really wear pins. So what do you think? What kind of bag does this one belong on? Would love your suggestions! GORGEOUS pin! I think a simple style would be important so the pin remains the focus. I'm picturing a flecked caramel color yarn and maybe a buttonhole style bag or even the bowling bag shape. That would be cool!